A funny, snarky, and engaging guide to getting a better biking city. Urban designer Mikael Colville-Andersen draws from his experience working for dozens of cities around the world on bicycle planning, strategy, infrastructure design, and communication. In Copenhagenize he shows cities how to effectively and profitably re-establish the bicycle as a respected, accepted, and feasible form of transportation. Building on his popular blog of the same name, Copenhagenize offers entertaining stories, vivid project descriptions, and best practices, alongside beautiful and informative visuals to show how to make the bicycle an easy, preferred part of everyday urban life. 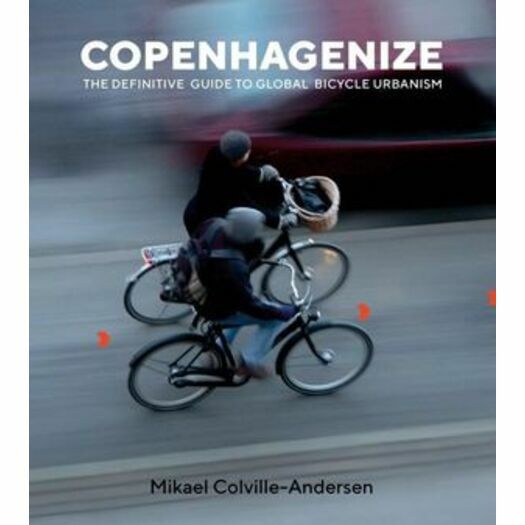 Mikael Colville-Andersen is a Danish-Canadian urban design expert and CEO of Copenhagenize Design Company, which he founded in 2009. He works with cities and governments around the world, designing their bicycle infrastructure and communications and coaching them towards becoming more bicycle friendly. He is a sought-after keynote speaker at design and architecture conferences and events around the world and is the host of the global television series about urbanism, "The Life-Sized City."